“It is just 100 years ago this year that the Blessed Mother appeared to a little girl in southern France,” said Father John Quinn, St. Bernadette’s first pastor. “Her name was Bernadette, and we are depending on prayers to St. Bernadette to help us organize our new parish, which has her as its patron saint.” The occasion was the conclusion to the first Mass at the newly formed St. Bernadette parish in southeast Kansas City, Missouri, on June 15, 1958. The faith was alive and well among the young families then expanding the metro area and it would remain so-Father Quinn concluded-if esprit de corps could be maintained. The Most Reverend John P. Cody, Bishop of Kansas City-St. Joseph, had appointed the Reverend John R. Quinn, a diocesan priest, to establish a new parish in Kansas City, Missouri, to be called St. Bernadette. The young parish enjoyed and endured the humblest of beginnings. For a time, Mass was held in a local dance hall, called the “Chicken Coop”. Humidity often rolled in through cracks and open doors only to condense on the metal overhead and pelt pioneers with rain during services. Confessions were heard backstage; folding chairs had to be set up and taken down every Sunday. The still popular tradition of serving coffee and doughnuts after Mass was started there. July 1958: A Rectory located at 8840 E. 52nd Terrace was purchased. Mr. & Mrs. Buford Briggs, 5408 Sycamore. July 14, 1958: The first St. Bernadette Youth Club meeting was held at 7:30 pm at the William E. Brewer residence. It was conducted by a seminarian, Mr. John Giocopelli, who became a diocesan priest. Other parish organizations also began around this time. February 2, 1959: Parish boundaries were officially established for St. Bernadette. February 7, 1959: First Marriage-Walter Hohenschild and Ann Barter. February 14, 1959: First Baptism-Mary Elizabeth Wissmueller. March 29, 1959: St. Bernadette’s “root” parish, Holy Family Parish in Leeds, closed. 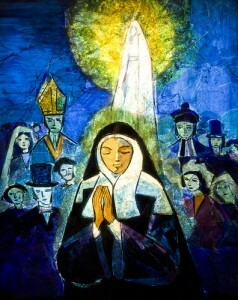 Many of its parishioners became members of St. Bernadette. Holy Family’s Franciscan mission cross and holy family statue were brought to St. Bernadette’s. May 17, 1959: Forty-three communicants were in the First Communion class. September 1959: 200 children from St. Bernadette were enrolled at Nativity of the Blessed Virgin Mary School in Independence. November 1, 1959: A building fund drive began with a goal of $125,000. January 10, 1960: A rectory was begun across the street from the church site. February 7, 1960: Ground breaking ceremonies were performed with Bishop Cody. Several hundred people were present, including mayors of Kansas City and Raytown and many Diocesan officials. March 6, 1960: St. Bernadette’s Credit Union was established at 2:30 pm on this Sunday. June 3, 1960: The first graduation class was held for St. Bernadette students attending Nativity of Blessed Virgin Mary School. June 26, 1960: An open house was held at the new rectory at 9021 E. 51st Terrace. December 1960: Father Joseph Staudinger, OSB, was appointed as the first associate of St. Bernadette Parish. February 15, 1961: Construction of the convent began. May 14, 1961: The last Mass was held at the “Chicken Coop”. May 21, 1961: The first Mass was celebrated at the new church at 6:00 am. June 18, 1961: Bishop Cody dedicated the new church building. 1966: A third floor was added to the school building. 1986: The last of our teaching Benedictine Sisters returned to their motherhouse in Atchison, Kansas. 1987: The Church renovation was completed. March 3, 1991: A parish center, Bauer Hall, was dedicated. March 29, 1997: A permanent baptistry was dedicated during the Easter vigil services. 1998: Celebrated 40th anniversary of the Parish. Renovated the church restrooms, pantry office, and vestibule office. 2000: The parish office was renovated, which included a ground-level meeting room. Also, all the parking lots were replaced and a new playground was constructed. June 2, 2002: After his ordination, on June 1, at the Cathedral of the Immaculate Conception, Fr. Paw Lwin celebrated his first mass here at St. Bernadette Church. May 30, 2003: The last school mass was held in the parish church, and our parish school ministry closed due to changing and aging demographics in existence. Spring 2005: Air conditioning was installed in the parish pantry and in the church restrooms, the cafeteria, the kitchen and the Emmaus room. Summer 2005: The Church exterior part was painted with Marian themed blue-tones to honor Mary and St. Bernadette. Spring 2008: The Church interior part was painted and her former red windows were replaced with stained glass-effect windows. October 12, 2008: St. Bernadette Parish celebrated its 50th Anniversary. Bishop Robert Finn celebrated mass along with Msgr. Henry Bauer, Msgr. Bradley Offutt, Fr. Kenneth Riley, Msgr. James Comiskey, Fr. Justin Howe, Fr. Michael Diochi, Fr. Kevin Ikpah, Fr. Richard Rocha, Deacon Emory Corrigan and Deacon David Townley. Parishioners, former parishioners, families and friends attended this special mass. After mass a catered meal was served to over 700 guests in Bauer Hall and the tent in the parking lot. A collection of photos from the past 50 years was displayed on a slide show and sold on CD. Many pictures were taken and a “50th Anniversary Pictorial Directory” was compiled. Spring 2012: Our Cafeteria name was changed to become our new St. Bernadette Parish Hall. New dinnerware was purchased in an effort to help our environment by “going green” and eliminate the frequent use of disposable paper goods. November 18, 2012: Former Pastor, Msgr. Henry G. Bauer celebrated his 90th Birthday with a reception hosted by CCW in Bauer Hall. December 13, 2012: A Mass of Christian Burial was celebrated for former Pastor Msgr. Henry G. Bauer who died on December 8th. In attendance were Bishop Robert Finn, Bishop Emeritus George Fitzsimmons of Salina, Kansas, nearly 50 priests and over 400 relatives, friends and parishioners. A funeral luncheon was served in Bauer Hall. Winter 2012: Efforts were being addressed to update/remodel the Church interior flooring. Winter 2012/2013: Renovations at the rectory included new shingles and guttering, a remodeled bathroom, refinished hardwood floors in the bedrooms and replacement of carpet in the living room and dining room. Winter/Spring 2013: New flooring was installed in the Church consisting of a combination of tile and carpet. Solar Panels were installed on the roof of the Church and Bauer Hall. Fall 2013: St. Bernadette Parish was host to over 150 parish staff members from around the Diocese who gathered to hear Abbot Gregory, OSB (Care For The Self/Care For The Other) at the annual “Day for Parish Staffs” hosted by the Diocesan Pastoral Care Committee. Gratefully, in unfailing St. Bernadette fashion, the CCW provided a delicious meal, refreshments and hospitality. Winter/Spring 2015: The kitchen, laundry room and bathrooms were remodeled in the rectory. NOTE: Historical artifacts, such as, newspaper articles, significant correspondence, and photographs are housed in an historical file in the parish office. These are available to parishioners for group and individual perusals.